The pin(s) are awarded each year in a different color. The 2019 pin color is Fuchsia. 3/4" diameter. Clutchback. Imported. Each membership star stands for one year of registration. Each membership star stands for one year of registration. Place the stars directly beneath the troop/group numerals on the sash or the right side of the vest, Girl Scout Brownie stars (on GREEN discs) (to the right of Daisy membership star, if applicable). Bridge to Brownie Girl Scouts is worn on the Brownie sash or vest directly under the Membership Stars. 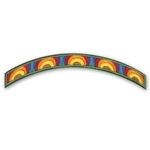 Bridge to Brownie Girl Scouts is worn on the Brownie sash or vest directly under the Membership Stars. The My Promise, My Faith Pin is earned by girls who want to find out what their faith and Girl Scouting have in common, using the Girl Scout Law as a guide. There is a different pin for each year a Girl Scout earns the recognition. Girls can earn this pin once a year at each grade level. 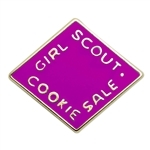 The color of the pin corresponds to Girl Scout Brownie grade level color. Imported. Girl Scout badges, awards and other insignia that are earned for the accomplishments of skill building activities or any set requirements should be presented, worn or displayed only after Girl Scouts have completed the requirements outlined in the appropriate program materials. For further information regarding earning requirements, please refer to The Brownie Girl's Guide to Girl Scouting. The My Promise, My Faith Pin is earned by girls who want to find out what their faith and Girl Scouting have in common, using the Girl Scout Law as a guide. There is a different pin for each year a Girl Scout earns the recognition. Girls can earn this pin once a year at each grade level. The color of the pin corresponds to Girl Scout Brownie grade level color. Imported. Girl Scout badges, awards and other insignia that are earned for the accomplishments of skill building activities or any set requirements should be presented, worn or displayed only after Girl Scouts have completed the requirements outlined in the appropriate program materials. For further information regarding earning requirements, please refer to The Brownie Girl's Guide to Girl Scouting. The updated Safety Award Pin is earned by following a five step process for staying safe, tailored to Girl Scout Brownies. The color of the cross on the pin corresponds to the Brownie grade level color. Imported. Girl Scout badges, awards and other insignia that are earned for the accomplishments of skill building activities or any set requirements should be presented, worn or displayed only after Girl Scouts have completed the requirements outlined in the appropriate program materials. For further information regarding earning requirements, please refer to The Brownie Girl's Guide to Girl Scouting. The Journey Summit Award Pin is earned by girls who have completed all three National Leadership Journeys at their grade level. The colored border around each pin corresponds to their grade level. This award is the highest award a Girl Scout Daisy and Girl Scout Brownie can earn. Imported.